In this compelling novel -- a cross between Lady Chatterley's Lover and The Aviator -- the acclaimed modern master takes us to riveting new territory. 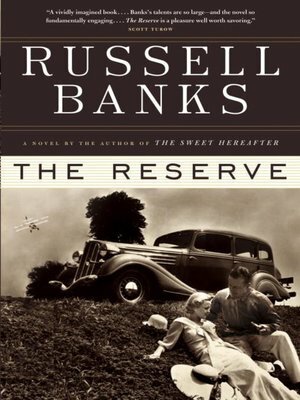 Part love story, part murder mystery, Russell Banks's The Reserve is as gripping as it is beautifully written, set in a pre-WWII world of class, politics, art, love and madness. Vanessa Cole is a stunningly beautiful and wild heiress, her parents' adopted only daughter. Twice-married, she has been scandalously linked to rich and famous men. On the night of July 4, 1936, inside the Cole family's remote Adirondack Mountain enclave, known as the Reserve, Vanessa will lose her father to a heart attack -- and meet Jordan Groves, a seductively carefree local artist whose leftist political loyalties to his working class neighbours are undercut by his wealth and his clientele. Jordan is easy prey for Vanessa's electrifying charm. But the heiress carries a dark family secret. Unhinged by her father's unexpected death, she begins to spin out of control, manipulating and destroying the lives of all who cross her path. Moving from the secluded beauty of the Adirondacks to war-torn Spain and fascist Germany, filled with characters that pierce the heart, The Reserve is a passionately romantic novel of suspense and drama that adds a new dimension to this acclaimed author's extraordinary repertoire.